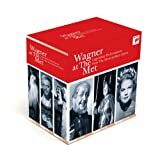 Our valued colleague at The Wagnerian blog has brought to our attention the planned release of a trove of historical recordings of performances of Wagner works by the Metropolitan Opera. The recordings have been remastered, and the artists include Melchior, Flagstad, Hotter, Varnay, Reiner, Szell and the rest of the gang. It is available from early April but you can pre-order it here. Thanks, Wagnerian — from all of us Wagnerians!